My latest oil painting: 30 x 40 “Ms. Sally”, Homecoming and dinner on the grounds in the 50’s. She is my great-grandmother. Some say, “It is not all about heritage, it is all about God.” Yes, I concur. But, God’s way of passing down the fact that it is all about Him, is through our prayers, words, and witness of our life to our heritage after us. It was Ms. Sally’s prayers that, (my Pop used to say), got him home from the war, and that, I believe, was the reason God still reached to Him and he was saved in his late 70’s. It was the unconditional love of my Pop that gave me my confidence and belief in grace. It was seeing my grandmother’s Bible on the table, and knowing she had been there at 5 that morning, that made me know there was something special in that book. It was the verbal and hands on blessing of my Dad that still touches my life today, and it was the gift passed down from my Mom, and that through her Dad, that allows me to share this Godly heritage through art. My children are now making their own choices. But all the while, they are being influenced by me, their grandparents, great-grandparents, and even the stories through art of their great-great grandparents. “Grass Roots” This is my “Pop”, my grandfather, “Ms. Sally’s” son. This is another picture I painted (acryolic on canvas) in ’07 of my Pop and me.I can still feel the coldness of his sleeves on the hot summer day… and I guarantee he had some “Double-mint” gum in his pocket to give me first chance he got. This is a picture I want to paint. 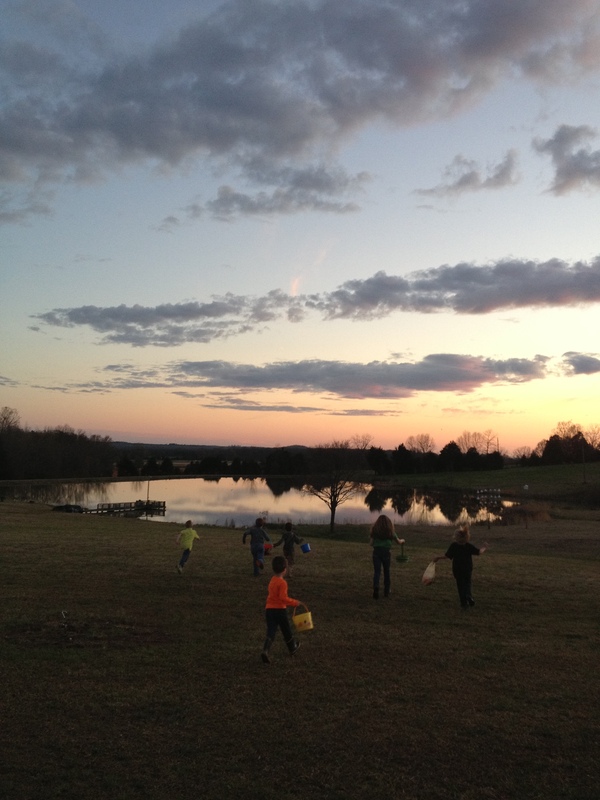 It is my children and thier cousins hunting eggs at Easter at my Dad’s place. My Dad is my “Pop’s” son, “Ms. Sally’s” grandson. “Driver’s Ed” My mother’s (Dot Courson) painting. (for the LORD thy God is a jealous God among you;) lest the anger of the LORD thy God be kindled against thee, and destroy thee from off the face of the earth. ¶ Ye shall not tempt the LORD your God, as ye tempted him in Massah. ¶ And when thy son asketh thee in time to come, saying, What mean the testimonies, and the statutes, and the judgments, which the LORD our God hath commanded you?